Home - IRI | International Registries, Inc.
International Registries, Inc. provides unmatched support and expertise, specializing in the shipping and financial services industries across a broad commercial and economic spectrum. Learn more about how to register your vessel. Explore payment options and quickly pay any outstanding fees. Find out more and quickly calculate your tonnage tax online. Use the user-friendly search option to explore information on RMI business entities. Search the Library to locate the information and documentation you need to form and maintain RMI business entities, register vessels or yachts, learn about seafarer certification, and more. Simply enter a keyword and click “find,” or visit the main Library and select from available options. Find information on how to form a business entity in the RMI, easily incorporate online, and learn more about the administrative support available to existing entities. Discover the highest quality ship registry services found anywhere in the world, 24/7. 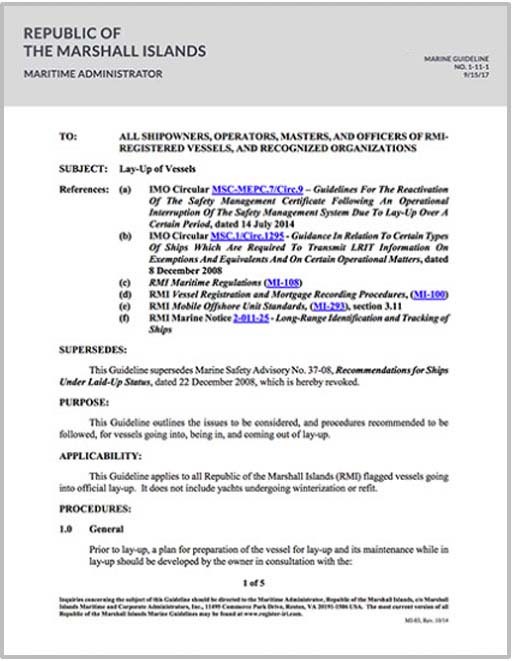 Access information about vessel inspections, radio station licensing, port activities, and more. Explore the different options available for yacht registration depending on yacht size, chartering time period, number of passengers, location, and more. Learn more about application procedures, take the first steps towards certification, and access the database to verify the validity of RMI certificates. With 28 global offices, International Registries, Inc., is the world’s most experienced, privately held maritime and corporate registry service provider, specializing in the needs of the shipping and financial services industries across a broad commercial and economic spectrum. Join us aboard and explore the story behind the world’s leading maritime registry provider.